Successful Lean transformation requires a deep understanding of the technical side of Lean supported by a culture that favors human development and broad employee engagement. But which comes first: culture or tools? Several decades of failed attempts to layer tools over a traditional culture suggest that Lean culture must come first; yet Lean culture can only be understood in context of the tools it supports, and the tools cannot be understood without practicing them. For example, without practicing set-up reduction, its impact on flexibility, reduced costs and improved customer service will not be understood. But without a culture that supports practice, meaningful improvements cannot be realized. This circular challenge has caused many Lean transformations to plateau well below their potentials. The answer to this chicken-egg dilemma and the theme of our 2017 Northeast Lean conference, is that both should be introduced and learned in tandem, in a holistic manner that embeds principles and concepts into the learning and practice of Lean tools. Tools are not really separate from culture; they are part of it. Even for organizations who have been on the Lean journey for many years there is value in relearning the tools in context of their supporting concepts and philosophy. For Lean beginners there is the opportunity to integrate tools and culture from the start as two sides of the same coin. Tools embedded with principles provide front line employees and managers with the intrinsic motivation to engage with the technical side of continuous improvement in a way that renders it continuous. ​GBMP was proud to offer the Shingo Institute foundational workshop DISCOVER EXCELLENCE on the two days following the conference at Primetals, also in Worcester MA. Conference attendees saved big on tuition. Learn More about The Shingo Model & workshops. 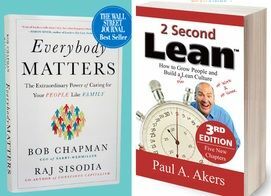 ​Every registered conference attendee received not one, but two complementary books: First a copy of keynote speaker Paul Aker's book 2 Second Lean - How to Grow People & Build a Fun Lean Culture at Work & at Home. It's full of practical ways to improve your life every day by making a simple 2 second improvements, it could transform every aspect of your life! Everyone also received a copy of The Wall Street Journal best-selling Everybody Matters - The Extraordinary Power of Caring for People like your Family by Barry-Wehmiller President & CEO Bob Chapman.